Eric Dehais directs our graphic design team. For over 25 years, he has been on the cutting edge of design and illustration for both print and digital advertising. He began his career in publishing at Scribners. During the early 1990’s he worked with some of the top creative directors of New York ad agencies, including McCann Ericson, Ogilvy, Chiat/Day, and BBDO. In 1995, he moved to Hearst Magazines with publications as varied as Esquire, Town & Country, and Cosmopolitan. While at Hearst, he helped launch the first online versions of their magazines. Since 2001, he has pursued his passion for progressive politics by working for our firm, designing high-impact mail pieces and providing direction and guidance to our team of designers. 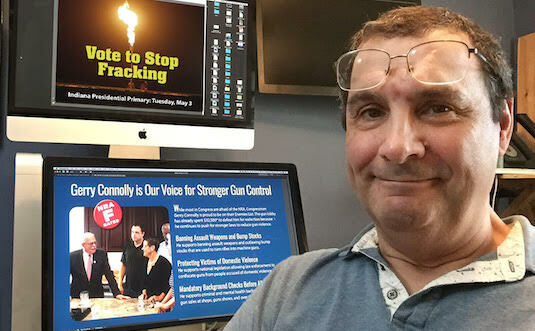 Eric ensures we create pieces that communicate easily and effectively, so voters can absorb our essential message even if they glance at a piece for just a few seconds. Eric grew up in Greenwich, Connecticut and graduated from McGill University in Montreal. © 2019 Mammen Group, Inc.